As with any electronic devices, a good, clean installation pays off in performance as well as reducing problems with stray wiring. With motorcycles it’s often difficult to simply find enough room for a data logger and all the associated wiring, and a rat’s nest usually results. In general, some planning beforehand with placing the unit, routing the wiring correctly and clearly marking everything goes a long way to making troubleshooting easier in the event of a problem. Most data acquisition units – even GPS-based systems – must be mounted in a specific orientation for any internal accelerometers to work properly. Most loggers use internal accelerometers to measure lateral and acceleration/braking forces. For these to work effectively, their orientation is important; your logger should have instructions to this effect, detailing how the unit should be positioned. The closer you are to the correct orientation, the more accurate your data (and track map if your unit uses the internal accelerometers to generate the map) will be. Be sure that you have access to any connections or data cards that you use to download the data. Nothing is more frustrating than having to move wires and disassemble bodywork after every session just to download the data. 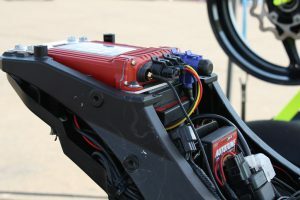 The unit must be powered by a clean, fused source that preferably is switched using the motorcycle’s key or on/off switch to avoid draining your battery. Avoid using a power wire that momentarily turns off when the starter is engaged – such as the headlamp – as the drop in power may adversely affect the logger. Another option is to fabricate your own power harness with a fuse and switch, and wire it directly to the battery. Keep in mind that in most cases, the logger must be turned on and operational when the motorcycle is running; sensors connected to a non-functioning input are adversely affected, in turn affecting how the motorcycle behaves. When running sensor wiring, label each wire at the logger unit so that you can quickly disconnect and reconnect everything if necessary. Avoid running unshielded single wires from multiple sensors together over long distances, as there is a slight chance of crosstalk between wires. Likewise, if a wire is too long resist the temptation to make a nice, tight loop with the leftovers; a large, loosely tied loop reduces the chances of interference. Be generous with zip ties, and place everything in as unobtrusive a place as possible.